According to the World Bank studies, the urban consumption will triple by 2030. By 2030, about 40 percent of humanity will be insufficiently supplied with water. At the same time, global energy consumption and food consumption will increase by 36 % by 2025. If urban infrastructures are to keep pace with these onslaught, we need to make them more intelligent. Technological knowledge and the available resources in the water, energy and nutrition sectors must be used sustainably in order to create an environmentally and climate-friendly development in cities and municipalities. 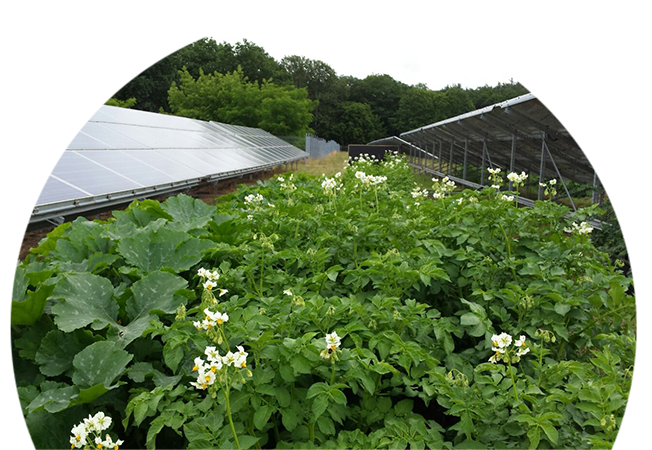 SUNfarming has developed the unique “Food & Energy Urban Concept”: Sustainable solar energy and regional food are produced together – on the same area. In addition to the solar power, vegetables, fruits, flowers or fish, regional or local PV production can be gained in new or already built PV free-field installations between the module series or in special agro-solar Food & Energy greenhouses. Based on our own developments, SUNfarming has developed unique agro-solar substructures for greenhouses. The roofs of the greenhouses are partially covered with solar modules for energy production. In the greenhouse vegetables, fruits and flowers can be cultivated under the solar modules. The system was originally developed to combine the production of electricity and food with the creation of jobs in the economically weak environment such as developing and emerging countries. However, it also offers the urban population the benefits of the combined double production of solar power and vegetables. Also, fish cultures can be bred here. With the SUNfarming Own-Electricity Concept, we have been supplying green electricity from our own PV plants to local authorities, commercial and industrial companies for years and can offer a price saving of approx. 10% below the market price. As a result of intensified urbanization and the resultant scarcity of resources, the renewable energy generation and the production of food between the modular series of our free field plants will become increasingly important in the future. In the first freefield trials, courgettes, potatoes and pumpkins flourish splendidly between the module rows. “Our experimental areas for potatoes on light soils in Brandenburg yield a yield of 55 to 60 t / ha. In Brandenburg, 38 – 45 tonnes are normal with irrigation, which results in an increase of 35-40%, “explains Peter Schrum founder of the SUNfarming Group. Municipalities and business areas permanently and sustainably save up to 10% energy costs against your energy supplier and at the same time increase your independence through your own green solar power from your municipal / commercial roofs. SUNfarming invests and installs your own power supply.